The animation has been remastered for this new medium. It is classic in every sense of the word. The animation seems to jump right out of the Dr. Seuss books (who was involved in the making of this short). The simplicity of the animation, unlike the animation in a lot of current cartoons, is not so overwhelming that it is distracting from the story. The creators managed to squeeze into these short 24 minutes, musical numbers to reinforce the stories being told. It’s almost as if the produces sat down with Dr. Seuss and gave him the opportunity to add more to his classic tales. While the animation and the music is clever, unique, and distinctly Seuss, it is the parable is the focal point. 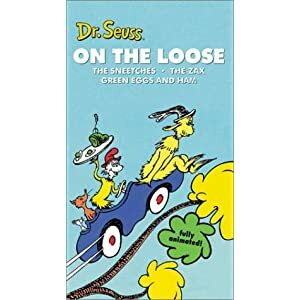 Dr. Seuss has always managed to tell parables for the 20th century. While his characters appear to be kid-friendly (and they are), his stories and morals are very much adult-needed. Dr. Seuss knew how to tell a story, and knew how to preach a sermon. In “The Sneetches,” there are Sneetches with stars on their bellies and those without. The Sneetches without stars feel different and they long to be like the Sneetches with stars. We can relate. There are those of us to appear to have it all and walk around with our noses in the air and teach our children to do the same. Then there are those of us who long day after day to be like those others. Wouldn’t life be so much better if we were? Then, there are those in society who capitalize on our desires to be like others. Our media is filled with advertisements for things that will change our bodies, change our minds, change our wardrobe, and so forth. The lesson of “The Sneetches” is that you do not have to change yourself to be like everyone else, nor do you have to treat others poorly because they are not like you. In “The Zax,” the North-bound Zax and the South-bound Zax bump into each other and neither will budge for the other. This parable ends with roads being built around them. Here in this parable, change is necessary. As Eric Erickson implies in his work, change happens. The world is changing constantly. Are we going to be a part of that change, or are we going to dig our heels in the sand and not budge? In “Green Eggs and Ham”, Sam I Am is endlessly trying to get the man to try his dish. He refuses because he does not like it, though he’s never tried it. How often we claim that we do not like something – a new style of worship, a new way of preaching, a new ministry – and yet, we haven’t tried it. Once the green eggs and ham are tried, they are loved. You don’t know if you like, till you try it. For those of us who claim the Christian faith, we claim a Savior who advocated for change. The societal attitude that you must change to be like me, Jesus said needed to change. Because of Jesus, we no longer need to dig our heels into the religious rites and traditions that are empty and without meaning. Through the Holy Spirit, we can experience a change and new life in our traditions and transform ourselves and the world around us.